MirrorSync 2.1 ships with new features for FileMaker 13! Major speed gains with FileMaker Pro and Go 13! Already running MirrorSync? Download the 2.1 update. With this update, MirrorSync 2 is still completely free for a single offline device. 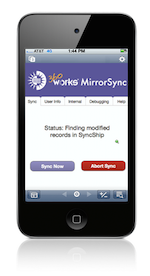 MirrorSync 2.1 is now much faster, especially with FileMaker Pro or Go 13. One customer saw his iPad sync times improve from 30 seconds to 6 seconds with this upgrade - 5 times faster! MirrorSync 2.1 now uses standard HTTP networking to transmit all files stored as container data. With this new feature, mobile FileMaker Pro/Go users never need to connect as a guest of FileMaker Server! IT administrators will greatly appreciate this feature, as it does not require port 5003 access, making it firewall-friendly, proxy-friendly, and bandwidth-efficient. It’s taken a lot of work, but we have resolved every single support issue. MirrorSync 2 is being used on a daily basis in countries around the globe for syncing everything from single-table systems with a few records to multi-file solutions with hundreds of thousands of records, and has been deployed on more than 50 new servers per month since launching in December. MirrorSync has always been known for its simple setup process. MirrorSync 2.1 continues to make improvements in this area with better validation and easier instructions. If you’re upgrading from version 2.0, all you need to do is run the installer, re-copy the script steps to your FileMaker database on the server, and you’re done! Users with older offline files will still be able to sync without interruption, but they will only get the speed benefits after downloading the database with the new script. If you’re new to MirrorSync, you’ll find that the setup time is often less than an hour from installation to your first sync. Many other improvements - see the changelog for full details! MirrorSync 2.1 is FREE for syncing a single FileMaker Pro or Go device (iPad, iPhone, laptop, or desktop) with FileMaker Server. Additional devices are priced as low as $50 each.